Keep the back leg straight and firm. Work on straightening the front leg. If you can’t quite get the front leg straight, it’s okay to bend it slightly. At first, keep the torso parallel to the floor. 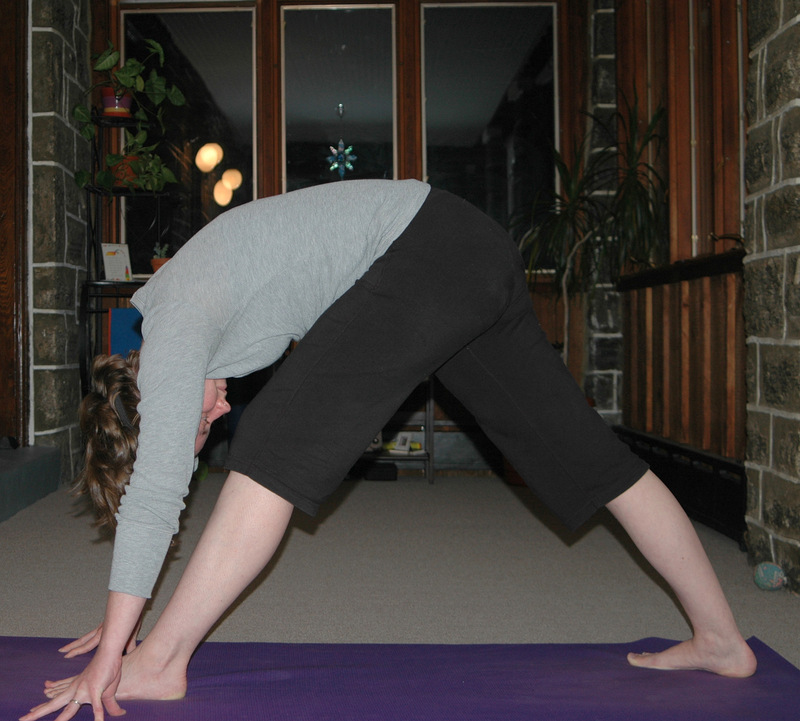 Then, if you have the flexibility, you can bend further while keeping the hips aligned and the spine straight. Although this is called “Head to Knee” pose, don’t focus on trying to bring your head to your knee. Instead, work on bringing your chin toward your shin – this will help to keep you aligned properly. Check in with your torso alignment: the midline of the torso should be above the line of the inner thigh. More flexible students can rotate to bring the midline of the torso over the midline of the thigh. Keep breathing. Work on lengthening the spine as you inhale and folding deeper on your exhales. Press strongly through the back leg to return to standing. Rise up slowly to avoid getting dizzy. Repeat the pose on the other side. Head-to-knee pose really stretches out the front leg, which is great when the backs of the knees or calves are tight. The pose also stretches the spine, improves posture and balance, and stimulates the abdominal organs. Those with knee injuries may want to avoid this pose. Those with a back injury or high blood pressure can try a modified form of the pose: practice facing a wall, and instead of bending all the way forward, bend just enough so that the torso is parallel to the floor and then press your palms into the wall for support. I never practiced this pose before coming to my current yoga studio, and I’ve struggled for a long time to figure out exactly what should be going on in this pose – which way are the hips facing? Should I feel so uncomfortable in this pose; am I doing it right? It seems like such a simple pose, but I continue to struggle with it. After working on asanas during October’s teacher training weekend, I understood this pose better, but I still feel some confusion when I try to teach it, so I wanted to spend a little more time learning about this pose. ok, going to stop before i confuse everyone! My teachers will go back and forth calling this either head-to-knee or pyramid. I’ve never heard janu shirsasana called head-to-knee! Boat pose is navasana! It can’t be called locust pose, that’s so weird! it’s even weirder, forrest calls shalabhasana a/locust (http://www.yogajournal.com/poses/789) boat. i don’t think forrest really does navasana… can’t recall ever having done that pose in a forrest class, which is also super weird. clearly this linguistic confusion is the work of the devil. That’s one weird-looking boat. Navasana is much more boatlike.